SAN FRANCISCO — The cattle ranchers and farm bureaus of America are not going to give up their hold on the word meat without a fight. In recent weeks, beef and farming industry groups have persuaded legislators in more than a dozen states to introduce laws that would make it illegal to use the word meat to describe burgers and sausages that are created from plant-based ingredients or are grown in labs. Just this week, new meat-labeling bills were introduced in Arizona and Arkansas. These meat alternatives may look and taste and even bleed like meat, but cattle ranchers want to make sure that the new competition can’t use the meat label. “The word meat, to me, should mean a product from a live animal,” said Jim Dinklage, a rancher and the president of the Independent Cattlemen of Nebraska, who has testified in support of meat-labeling legislation in his state. 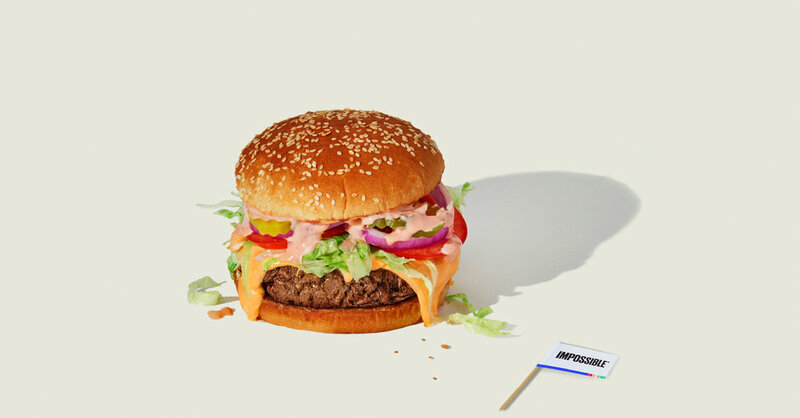 The push for state labeling laws is a reflection of how quickly start-ups like Beyond Meat and Impossible Foods, which produce burgers from plant-based ingredients, have grown to challenge the traditional meat industry. Sales of plant-based meat substitutes increased 22 percent to $1.5 billion last year, according to Euromonitor International, a market research firm. Other start-ups are getting closer to being able to create chicken nuggets and sausage from actual meat cells grown in a lab. Even though it is not yet commercially viable, traditional meat producers are worried the lab-grown meat could eventually become a low-cost alternative with little regulatory oversight. Meat producers say they don’t want to lose control of labeling like the dairy industry, which lost its battle to keep almond and soy producers from using the word milk on their beverages. Egg and even mayonnaise producers have faced similar fights. “Almonds don’t produce milk,” said Bill Pigott, a Republican state representative in Mississippi who wrote the legislation there. He owns a farm that has produced both dairy and beef. But his worries have gone beyond almond and soy liquid’s being labeled milk. “The fake, lab-produced meat is a little bit more of a science fiction-type deal that concerns me more,” Mr. Pigott said. He introduced his bill in January after the local association of cattle ranchers contacted him. It passed in the state’s House and is waiting for debate in the State Senate. The various legislative efforts are likely to face tough challenges — and not just from vegetarians. A bill in Virginia was voted down after lawmakers received a letter from the National Grocers Association, the Grocery Manufacturers Association and the Plant Based Foods Association that defended increasingly popular products. It said requiring “new and unfamiliar packaging would only confuse shoppers and frustrate retailers at a time when demand for such options is at an all-time high,” growing at 23 percent a year. The most restrictive proposal, in Washington State, would make it a crime to sell lab-grown meat and would bar state funds from being used for research in the area because some lawmakers say not enough is known about it to consider it safe. The bill has not yet come up for a vote. Surprising coalitions are forming around the future of lab-grown meat. The North American Meat Association has said it wants lab-grown meat to be referred to as meat to ensure that new products are not able to shirk any of the regulations applied to traditional meat. And most large meat companies have stayed out of the debate. Some of them, including Tyson and Cargill, have made investments in lab-grown-meat start-ups. In Nebraska, a meat-labeling bill was written by Carol Blood, a Democratic state senator from suburban Omaha. Despite her last name, Ms. Blood has been a vegan for years. She said she had decided to pursue her bill after overhearing two women in her local Fresh Thyme supermarket expressing confusion about whether a package of Beyond Meat burgers contained animal flesh. Beyond Meat is not, in fact, produced with any meat. It gets its trademark bloody look from beet juice. “We provide the consumer with meat made from plants, and believe that it is reasonable for the consumer and for us to refer to our products as plant-based meats,” the chief executive of Beyond Meat, Ethan Brown, said in an email. That law has been challenged in court by the company Tofurky, which specializes in tofu and other soy-based foods, as well as the local branch of the American Civil Liberties Union and other groups. Sarah Sorscher, who works on regulatory affairs at the Center for Science in the Public Interest, said there was little evidence that consumers were confused by the labeling of alternative meat companies. Beyond Meat has received assurances from the authorities in Missouri that its labels make it clear that the product is not meat and will not run afoul of the new law. The Good Food Institute, which represents both plant-based meat companies and cell-based-meat start-ups, has scrambled to get employees and lobbyists to state capitals where laws are being considered. Jessica Almy, who is the policy director for the organization, said she believed that most of the state laws and proposals would be rendered moot if and when the Agriculture Department weighed in on labeling for lab-grown meat, which it promised to do last year. Still, she argues that the state-mandated labels could create more confusion for consumers. “There is no truthful way to refer to it without using meat terms,” Ms. Almy said. Mr. Dinklage, the Nebraska rancher, said he was also interested in providing clarity to consumers. He also wants to protect a livelihood that is growing harder all the time.